While these beautiful birds are called silver pheasants, they are not actually members of the pheasant family. These birds are also known as Silver Kalage Pheasants, White Chinese Pheasant, White Fowl, Silver Fowl and other similar names. It is a native to China, like the Mongolian pheasant and was considered by Britains to be an optimal bird for keeping in aviaries. But, these territorial birds would chase other species out of more open coverts. Silver pheasants are fairly tame in captivity with the notable exception of mating season. They have exceptionally long spurs which make them even more dangerous to humans and other birds during this time. Like many birds, the male is prettier. But, in this case, the females are bigger. The hens can lay 10-14 eggs and are considered good mothers. 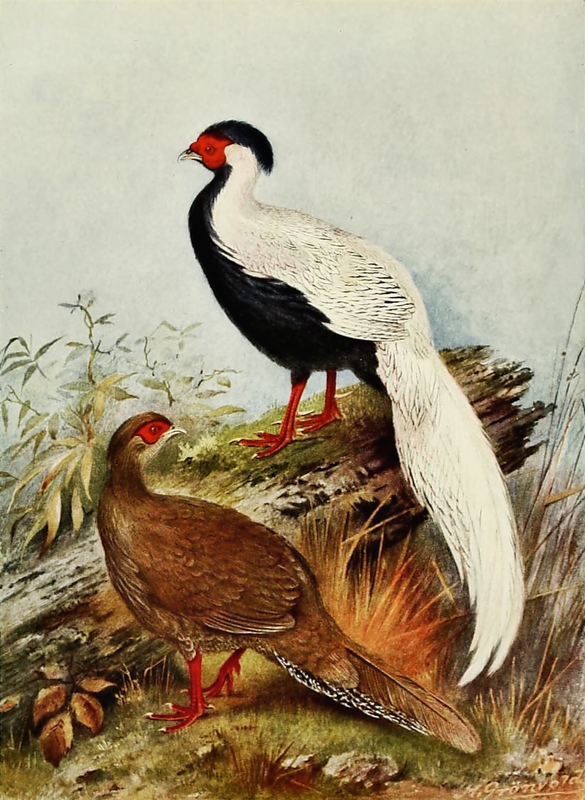 This vintage, full-color book plate shows both the male and female of this species. The artwork was included in Frank Towend Barton’s 1912 work Pheasants in Covert and Aviary. There were several versions of this book published. Barton used a number of illustrators and artists. In this case the artist was Henrik Grönvold (1858–1940). Grönvold was a Danish naturalist and artist, known for his illustrations of birds. This silver pheasant drawing shows the pair of birds. Though the written narrative said the females are larger, it would seem this pair is fairly evenly sized. The male is so very striking with the white or silver feathers down his back and tail. His wings are white outlines in dark shades. His belly and chest are blackish purple that can appear irredescent. The female’s feathers are mostly brown but her belly and under her tail are black and white. Both birds have orange-red feet and the skin of the face and wattles is crimson. Male and female silver pheasants have fairly large crests; the male’s being more dramatic and longer. One unusual characteristic of these birds is that their tail feathers are compressed laterally. I wish the quality of the scan were a bit better but hopefully the fairly large size of this vintage white pheasant drawing will provide you a nice variety of options for using the work. To see the largest version of this silver pheasant drawing, please click on the drawing to access the image file.